New Update, DAZ 3D Install Manager 1.0.1.90, Now Available! DAZ 3D is pleased to announce the next public version of the DAZ 3D Install Manager - version 1.0.1.90! The 1.0.1.90 version is a maintenance release and fixes or makes improvements to several issues discovered since the 1.0.1.81 General Release. More detail on specific fixes/changes/improvements can be found in the Change Log, which can be viewed online within the Documentation Center portion of our site. All new downloads of DAZ 3D Install Manager will be of this version. 1) Fixed #IM-61: Files that have been renamed or moved during a software/plugin update are now handled correctly; some files that should be renamed or moved by an update were being orphaned during updates to packages that install like software and/or plugins (to include content packages that install like plugins, i.e. Carrara, etc). 2) Fixed #IM-64: The ability to create an account in "Work Offline" mode, has been restored; this regression bug affected installations on computers that were not connected to the internet at the time that the attempt to create an account occurred. 4) Fixed a bug with Carrara native content installation on Mac; native content should install in the Carrara.app folder within the mapped application folder, not in the application folder itself as on Windows. 5) Fixed a bug with Carrara plugins installing to a Carrara.app folder nested within the Carrara.app folder on Mac. 6) Improved the first use experience by collapsing initial account creation into the account dialog; account button/drop-down and label are replaced by an email text field and label on first use; uses a default name for the account. 7) Made tweaks to the parsing of Advanced Filtering in the Filter Field to be more dynamic. 8) Tweaked the “Package Files…” and “Installed Files…” menu item labeling; added a “Show” prefix to clarify purpose (i.e. show package contents vs. create a package). 9) Updated the CMS client; improves communication between the application and the CMS server; a CMS server update that improves stability is still pending. 10) Includes the initial framework for retrieving serial numbers from the store and passing them to installer packages; requires an active connection; requires support in package manifests. Where do I find the version number? I looked in the docs and couldn't find a reference to where it is located in my DIM? Upper left corner. It's just to the right of the giant Daz IM logo. It's tiny and easy to miss. Does the program still insist on creating and using a folder in Public Documents to keep some of its files in? You can change the library things go to in the settings > installation tab. + to add a library, - to delete one. 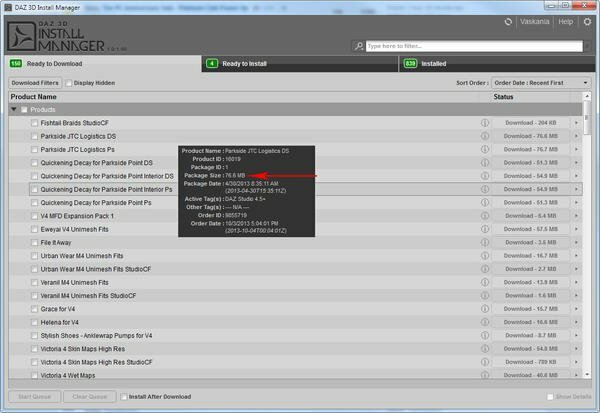 Uncheck auto-install after download on the ready to download tab, and check show details on the ready to install tab. I fail to see the issue, unless you are using an extremely small ssd drive. I have over 3,000 products installed and the total space used is just over 50 MB. This is the space used for the combined file and user manifest files that DIM uses to track installed items. Just noticed this- thanks for adding the download speed in the bottom right. Ok. Manually uninstalled my plugins, the beta (dim), and my manual install of 4.6.0.18. Installed this new version, some DIM-enabled plugins/shaders/cameras, and all went without a hitch. Even the Photoshop 3D bridge went where it's supposed to and works. Thanks. I had to put my nose to the screen to see it. Black on dark gray is bad bad bad. And those letters are teeny. No big deal except it's also hard to see the progress/busy bar movement on the right. Far easier on the eyes - click on the gear icon (settings) and then on view log (bottom left) and scroll down the log to the last startup. Takes a bit longer though. I think the download speed has always been there. What I still want is a size of selected items, since I have a bandwidth cap. You're looking for a total, correct? Tacky, but - right-click on one of the selected items, click 'export selected to csv', open in your preferred spreadsheet ap, and total the size column. The only flaw in the ointment is that the export option is not available while downloading. Ah, thank you - I was afraid it would be as displayed and the sizes in KB instead of MB would throw it, but it's the raw number so all I have to do is divide by 1024^3 to get the full size. Is there a trick to possibly get DIM to bypass the account window and auto-login? I think the download speed has always been there. Also, you don't have to export the CSV to get the file size. Just hover over the package and read the Package Size line in the dark gray box that pops up. Tick the "Work Offline" box. The CSV export lets you sum up the sizes of all the selected packages, rather than having to check one-by-one. I want to stay online, just not click that start button every time. If I choose to work offline, then I don't get my downloads. Good point. Didn't think of that. Ah, sorry, misinterpreted your question (stupid flexible English syntax!). You want it to just log in on start without you having to hit the start button. I don't think there's any option for that, but you could put in a feature request. Vask do you not have a remember me where the password is? Cause I have it ticked, you might be right though cause when I shut it back down and brought it back up I had retype my password :-(. Edit: Oops I think I misinterpreted it also. Just in case I did sorry. After I unticked that remember me box and retyped my password it now remembers it :-). Mike: Exactly! What dept do I send DIM feature requests to? Tech? Island: It's ticked, and it does remember my password, but you still have to click 'start' every time. I want to bypass that screen altogether and just have it log me in on it's own. Ahhh yep I sure did misinterpret it, I can safely blame my meds....lol. That would be a good feature to have :-). Sorry again for the misunderstanding. Have a great weekend and take care :-). Yes, send it to Tech Support, you can also put "DIM Feature Request" as part of the title. this is weird. I just updated to the new DIM version, and in my "Insttalled" tab, there is NOTHING. Nor do I have any "Products Updated" whereas yesterday, there was a heap of them to update. And also obviously, my "Installed" tab was full. the download speed has disappeared for me in the new version. Lol what the? It shows for me in the lower right of the Ready to Download tab as things are downloading. Does your version (upper left of DIM to the right of the logo) say 1.0.1.90? That was me with my bad eyesight, not seeing it. Heh. it HAS always been there. LOL. That's how i noticed that i got a FAR faster download speed via DIM than I did downloading from the site itself. It's the main reason I use the DIM.